The Reformers viewed the gospel as not merely one thing among many in the life of a church but rather the means by which the church exists. When the gospel is rightly declared and applied to God’s people, the church becomes “a creature of the Word.” She understands, embraces, and lives out the reality of Christ’s birth, life, death, and resurrection in more than her doctrinal statement. The gospel impacts all the church is and does. Matt Chandler se desempeña como Ministro Principal de Enseñanza en la Iglesia The Village, en el complejo metropolitano de Dallas/Fort Worth, Texas (EE.UU.). Llegó a la mencionada iglesia en diciembre de 2002 y describe su ocupación allí como un esfuerzo de replantar donde participó en el cambio de la cultura teológica y filosófica de la congregación. La iglesia ha experimentado una enorme respuesta de crecimiento, de 160 miembros a más de 11,000, con establecimientos en diversas localidades del complejo metropolitano. Actualmente Matt participa en los esfuerzos de plantación de iglesias a nivel tanto local como internacional mediante la Iglesia The Village y diversas alianzas estratégicas. Se desempeña como presidente de Hechos 29, una organización de plantación de iglesias a escala mundial. Durante los 10 últimos años, Hechos 29 surgió de una pequeña congregación y se extendió a unas 500 iglesias en los Estados Unidos y alrededor del Mundo. Además de disertar en conferencias alrededor del mundo, Matt ha escrito varios libros, entre los que se incluyen The Explicit Gospel (El evangelio explícito) y Creature of the Word (Criatura de la Palabra), publicados en abril y octubre de 2012 respectivamente. Aparte de Jesús, su mayor alegría es haberse casado con Lauren y ser el padre de sus tres hijos Audrey, Reid y Norah. Matt Chandler serves as Lead Pastor of Teaching at The Village Church in the Dallas/Fort Worth metroplex. He came to The Village in December 2002 and describes his tenure as a replanting effort where he was involved in changing the theological and philosophical culture of the congregation. The church has witnessed a tremendous response growing from 160 people to over 11,000 with campuses in Flower Mound, Dallas, Denton and Fort Worth. Matt is currently involved in church planting efforts both locally and internationally through The Village and various strategic partnerships. He serves as president of Acts 29, a worldwide church-planting organization. Over the last 10 years, Acts 29 has emerged from a small band of brothers to nearly 500 churches in the United States and around the world. Beyond speaking at conferences throughout the world, Matt has also written two books, The Explicit Gospel, published in April 2012, and Creature of the Word, released in October 2012. His greatest joy outside of Jesus is being married to Lauren and being a dad to their three children, Audrey, Reid and Norah. Josh Patterson serves as lead pastor of Ministry Leadership at The Village Church located in the Dallas/Fort Worth region of Texas. He and his wife, Natalie, are the proud parents of Lily, Luke, and Liv. Our homes, communities, cities, and nations need churches that are immersed in the gospel and fueled by the gospel. Why? Because the good news of Jesus Christ changes everything! I am encouraged and excited by the strong gospel challenge found in Creature of the Word: The Jesus-Centered Church. Matt, Josh, and Eric provide a clarion call for our churches to recapture their awe for Jesus and His perfect work accomplished on our behalf. They help us see how the beautiful bride of Christ can be possessed by both a doctrine and a culture centered on Jesus. This is the kind of book the Church has needed for a long time. Creature of the Word is a crystal clear call to the Church to recenter around Jesus and the gospel. Practical yet theological, I recommend this book as essential reading for anyone who would lead or plant a church. Too often Jesus Christ is central to our theology but not to the way we do church. This book serves as a needed reminder and a powerful corrective for those of us who must continually recalibrate our ministry for Jesus with the person and work of Jesus. Chandler and his colaborers Josh and Eric are calling us to make church about Jesus, again. Be careful if you read this book. Creature of the Word will make you rethink much of what you think you know about the Church, its message, and its mission. Matt Chandler, Josh Patterson, and Eric Geiger have conspired to write a book that will make you think more faithfully about the church and what it means for Christ’s people to be formed by the gospel. I welcome the conversations this book will spark. Lately many books are coming out with a title that has “gospel” in it. As you begin to read the philosophical and allegorical talk about the gospel, there is a disconnect from the Word of God. However, what is phenomenal about Creature of the Word is that it is gospel-centered and rooted in the Word of God with uncanny readability. I hope that thiswork will devotionally impact the whole people of God and increase our intimacy with our God. The Bible has been referred to as the “Him Book” because it’s all about Him. 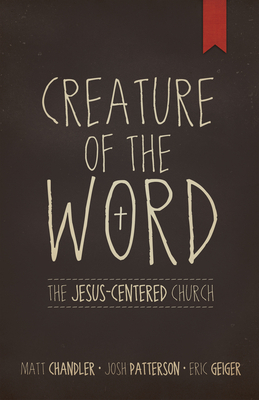 In Creature of the Word, we will be challenged to keep everything Jesus centered. This commitment always leads us into His work. Godly leaders from my generation have prayed and deeply desired for a new generation of church leaders to lead His bride well. Works like Creature of the Word are an answer to our prayers. I am excited and hopeful for the local church after reading the encouragement and challenges Matt, Josh, and Eric offer. What an incredible book by three incredible leaders! I look for five things when reading a book: readable, accessible, practical, helpful, and fresh. This book by Chandler, Patterson, and Geiger scores highly on all counts. It is a book church leaders should read,but it would be a great pity if the target audience was limited to that select group. Whatever your role or place among the people of God, do not hesitate to pick up this book and be refreshed by the insights, observations, and challenges you’ll find here. But primarily, the fresh encouragement to us to focus on, and be all about, Jesus. Creature of the Word excites me because I know the result of churches centering themselves on Jesus, and His redemptive mission will result in God’s people engaging in kingdom work. Church leaders and staff teams should read and discuss this book in community. Creature of the Word paints a compelling and exciting picture of what a church can be under the gospel of our Lord Jesus Christ. Matt, Josh, and Eric offer sound and practical insight that will encourage and challenge church leaders. How refreshing it is in a model-driven church world to read the call to all to be a Jesus-centered church! This alone makes me want to shout!